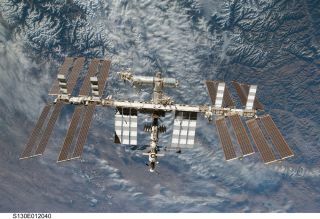 The International Space Station, as photographed by crewmembers aboard the space shuttle Endeavour in 2010. Registration is now open for a November conference that aims to help bring space technologies down to Earth. People can now register to attend the first-ever SpaceCom (short for the Space Commerce Conference and Exposition), which runs from Nov. 17 through Nov. 19 in Houston. "NASA has been doing this; other companies have been doing this for some time," Causey added. "We're just sort of wanting to accelerate it, so that, over the next three to five years, we can really build a sustainable commercial market." The conference should help attendees learn how to raise money for new ventures, put them into contact with new customers and show how businesses can better exploit suborbital space and low-Earth orbit, especially the International Space Station National Laboratory, organizers said. A number of big names in the fields of spaceflight, exploration and space technology have signed on to speak at SpaceCom, among them NASA chief Charles Bolden, Virgin Galactic CEO George Whitesides and George Nield, associate administrator of the Federal Aviation Administration's Office of Commercial Space Transportation. But the conference will also feature a number of speakers from outside the aerospace field, including Yuri Sebregts, chief technology officer at the oil and gas company Shell; and Nissan Research Center director Maarten Sierhuis, who will discuss the company's work on autonomous automobiles. "It's a very good list of speakers," Causey said. "We're very, very pleased with where we are."